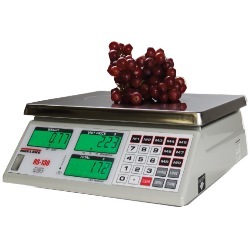 Quite often many customers purchase new digital scales or they have their current scale calibrated or certified. These are typically scales they can use at places like the farmer’s market to sell their produce by the pound. Basically any device used where items are bought or sold by weight is normally required by most state’s laws to be inspected and certified each year. This would include a counter top digital scale at a farmer’s market (or mechanical hanging scale) that is used to weigh produce that customers want to buy. Of course, inspecting a retail scale is an advantage to both the farmer and the customer. As you can see below it’s important to have accurate and legal weighing equipment. Keep in mind the article was for South Dakota, so be sure to check with your state department of agriculture or weights and measures to see what your state’s rules are. The author of the article also said if you do not want to purchase a certified scale then you must sell your items by the bag, piece, or bunch — or in pint or quart containers. This is not the selling method I would recommend. These days customers are counting every penny and want to know exactly what they’re paying for. Your customers want to know exactly how much they’re buying and likewise how much it costs. Even if you chose to not use a certified scale at the market, you still might want to check weigh some of the bags or buckets to make sure that you and the customer are getting the correct portions versus profits. Of course we’ve discussed this topic before on this site but if you are buying or selling your items based on weight, you want to make sure that you purchase a scale that has NTEP approval with a certificate of conformance number. The CoC# should be on the side of the scale in most cases. Often consumers search for “certified scales” and they get lumped together with legal for trade NTEP Approved scales. Technically, a scale can be NTEP approved legal for trade and not be “certified”. Often times, the proper procedure for obtaining a “certified scale” is to do the following. 1. Buy a NTEP Approved Legal for Trade Scale. In most cases, you do not receive any paperwork saying your scale is “certified”. All you receive is your scale, with the certificate of conformance number (CoC#) stamped on the side of the scale. 2. Have the scale checked and calibrated in your store or at your produce stand, in other words in its final working location — by either a local scale company or the state weights & measures. At this point, in most cases, you receive paperwork showing the test results. 3. Have the state weights & measures come by and “certify” your scale and place their sticker on the scale. So as you can see, in most cases you can search for and buy “certified scales” but they aren’t quite certified until you do a little homework upon receiving your scale. The reason for this is simple. A scale can be NTEP approved and have a CoC# but that doesn’t mean it is 100 percent accurate. Perhaps the scale was calibrated in a different region of the country and gravity has changed just enough to throw the calibration off. Suppose the delivery company decided to use your scale as a football? That can very easily throw off the calibration of a scale. That is why it is always a good idea to buy your NTEP Approved “certified scale” and get it checked and calibrated locally to ensure you comply with your state regulations.